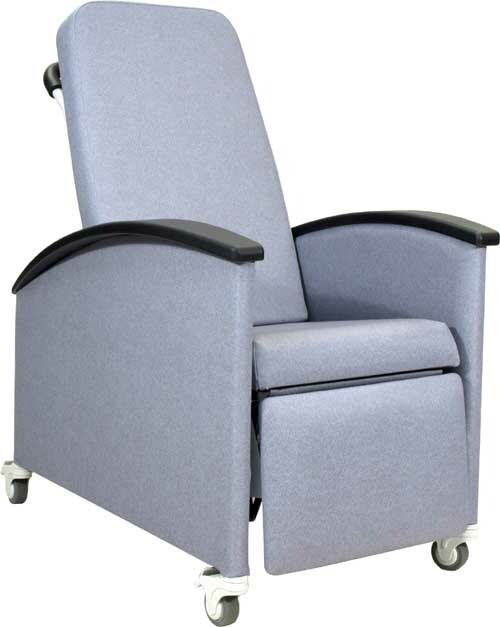 The 5251 Convalescent Recliner features blow-molded vinyl covered side panels with convenient recessed grip areas and side pocket. 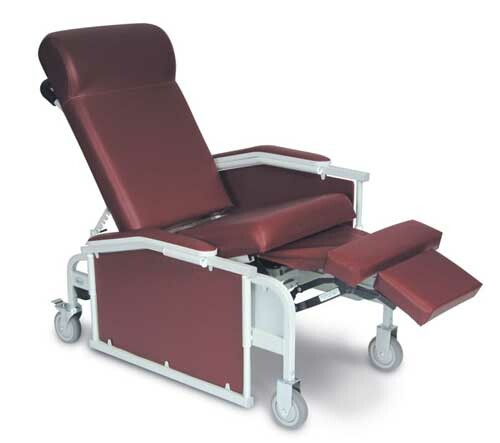 It has such standard features as 5" total lock casters, non-porous blow molded tray with removable locking function, comfortable ergonomic built-in headrest and heavy gauge expanded vinyl. It also has multiple locking positions for added comfort. Winco model 5261 is identical but without the tray. 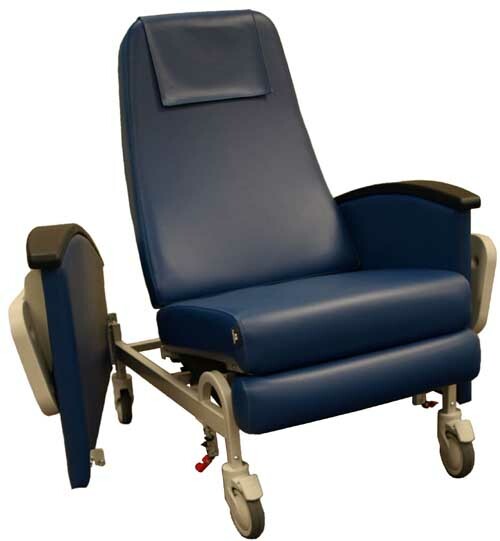 The 525S Convalescent Recliner w/ Saddle Seat features blow-molded vinyl covered side panels with convenient recessed grip areas and side pocket. 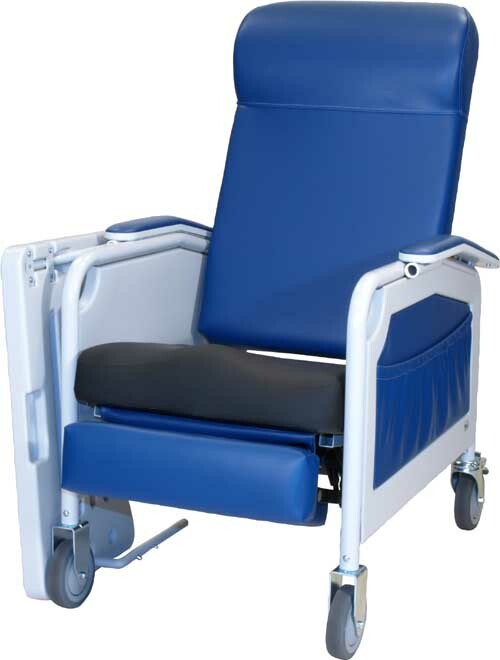 It has such standard features as 5" total lock casters, non-porous blow molded tray with removable locking function, comfortable ergonomic built-in headrest and heavy gauge expanded vinyl. It also has multiple locking positions for added comfort. A high stretch, lightweight polyurethane top cover material that provides less seating resistance, improved pressure relief, better airflow and minimizes accumulation of moisture. 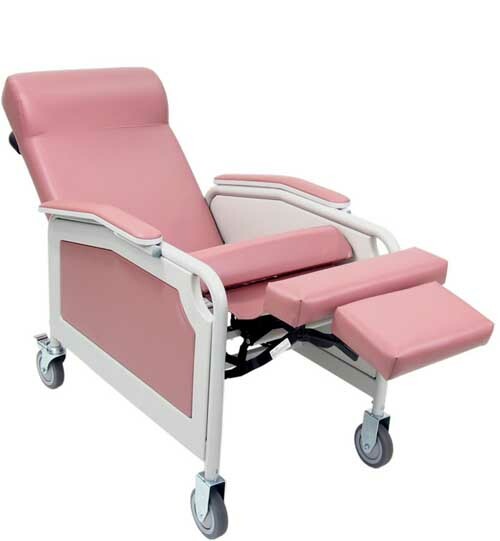 Double density cushion for increased protection including a saddle type seat that provides the proper adduction/abduction of the proper positioning of the legs including keeping the critical pressure points from making improper contact. A surface gel pack that molds to the body provides extra protection and helps to keep the legs / body in the proper position. 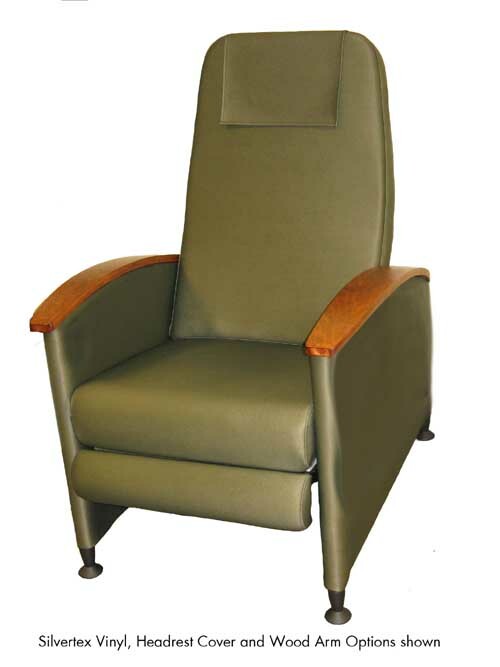 The 5261 Convalescent Recliner features blow-molded vinyl covered side panels with convenient recessed grip areas and side pocket. It has such standard features as 5" total lock casters, comfortable ergonomic built-in headrest and heavy gauge expanded vinyl. It also has multiple locking positions for added comfort. Winco model 5251 is identical but with the addition of a non-porous blow molded tray with removable locking function. 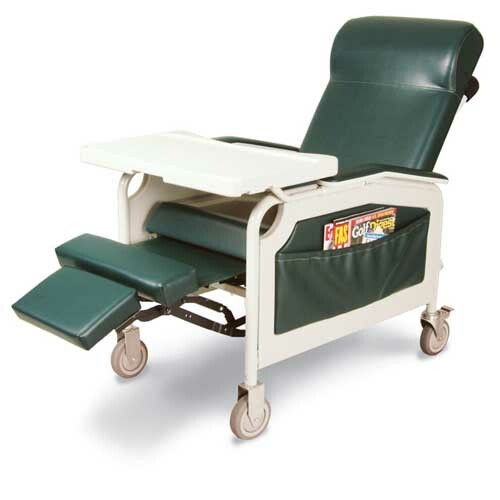 The 526S Convalescent Recliner features blow-molded vinyl covered side panels with convenient recessed grip areas and side pocket. It has such standard features as 5" total lock casters, comfortable ergonomic built-in headrest and heavy gauge expanded vinyl. It also has multiple locking positions for added comfort. Winco model 525S is identical but with the addition of a non-porous blow molded tray with removable locking function. 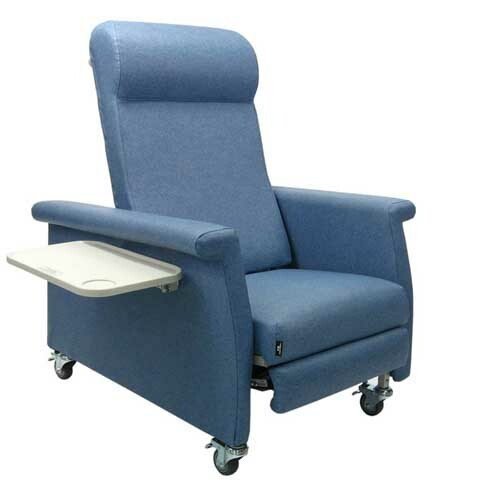 The 5271 Drop Arm Convalescent Recliner features left and right drop arms for easy access and transfers. It has such standard features as 5" total lock casters, non-porous blow molded tray with removable locking function, comfortable ergonomic build-in headrest and heavy gauge expanded vinyl. Winco model 5281 is identical but removes the tray option. 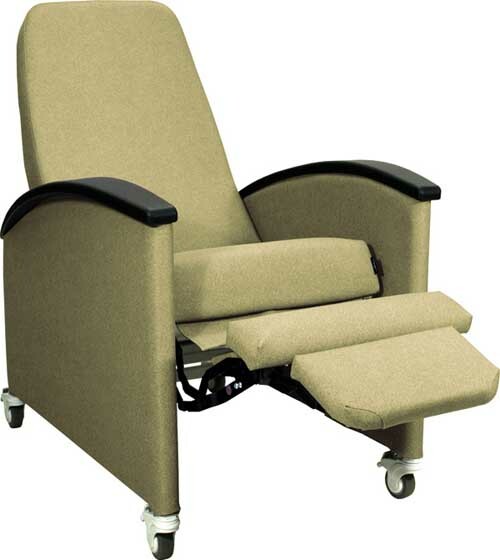 The 5281 Drop Arm Convalescent Recliner features left and right drop arms for easy access and transfers. It has such standard features as 5" total lock casters, comfortable ergonomic build-in headrest and heavy gauge expanded vinyl. Winco model 5271 is identical but also includes a non-porous blow molded tray with removable locking function. Value, Style and Winco Comfort! The Winco 5400 gives long term recliners a whole new look with fully upholstered sides. Durable and comfortably contoured Urethane arms protect the upholstered finish while providing a sleek and modern style. The unique ione-piece legrest is comfortable and stylish. The 5400 offers a great value price range while offering home furnishing looks and the required clincal durability and functionality! A perfect choice! 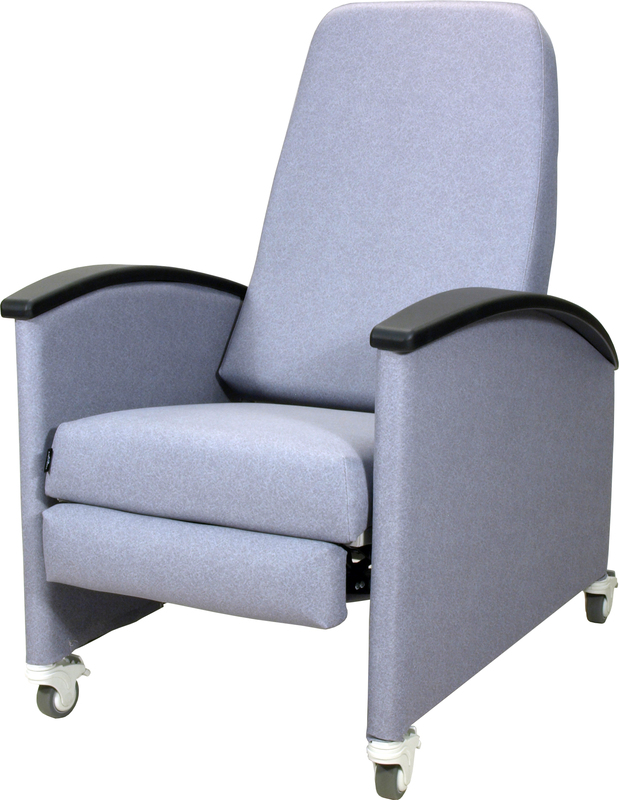 Sleek design and comfort to suit any patients' needs. 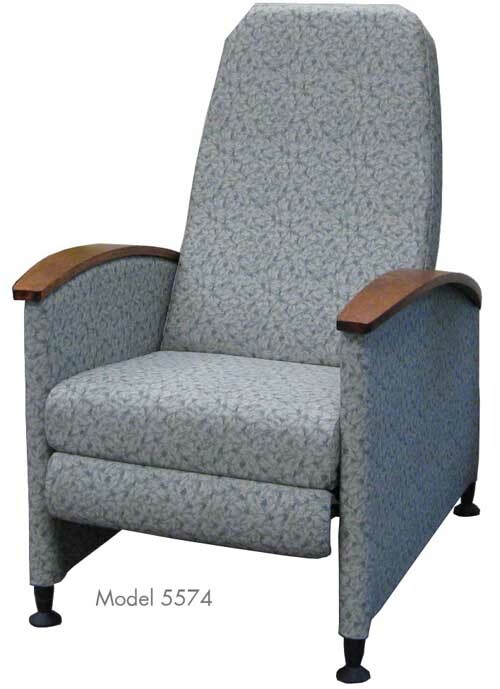 The Winco 5570 Premier Care Recliner has fully upholstered sides that add contemporary style, modern form, and function. Durable and comfortably contoured urethane armrests protect the upholstered finish while providing a sleek and modern style. Model 5574 foregoes casters and substitutes Pedestal Feet for more of a fine furniture look yet keeping the utility of the 3- position lock. 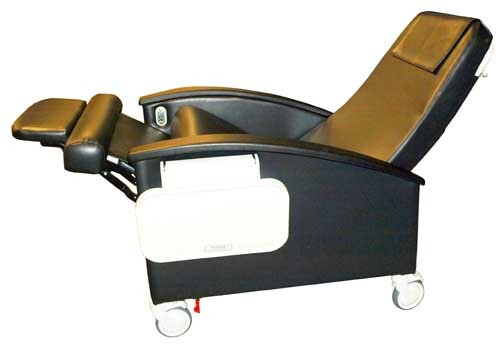 Optional heat and massage completes the 5570/5574 as the ultimate medical recliner. 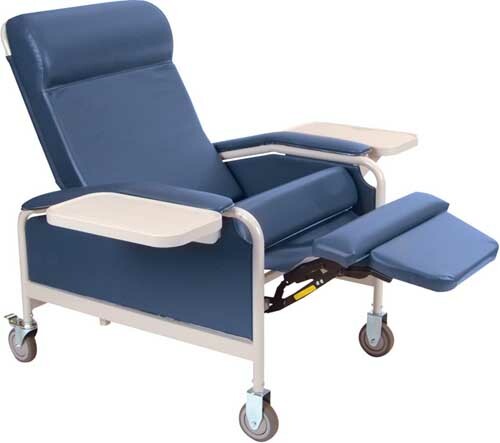 The Winco 5580 Cozy Comfort Premier Recliner with fully upholstered sides offer contemporary style, modern form and function for patients or visitors in any setting. The Model 5584 substitutes Pedestal Feet for an even more home-like appeal. 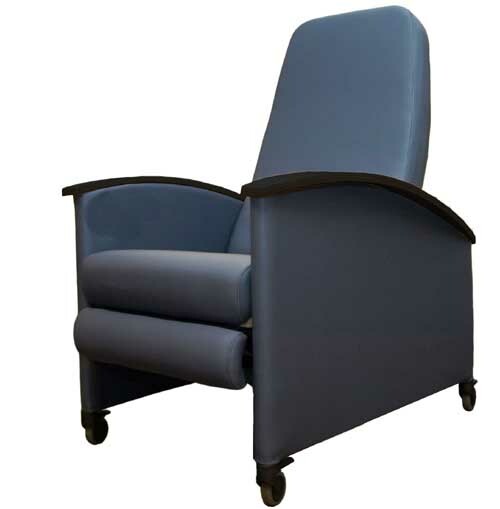 NEW Check out our Model 5670 XL in this same style that provides a wider seat and a higher weight capacity of 450 pounds! Durable and comfortable contoured urethane arms protect the finish while providing a sleek and modern style. Or choose from several wood arm options for a warm, elegant upscale look. Add optional heat and massage for the ultimate in a comfortable beautiful recliner. The 5670 XL, capacity and practicality in a non-clinical package! The new 5670 offers sleek, easily cleaned urethane arms in a beautiful style. 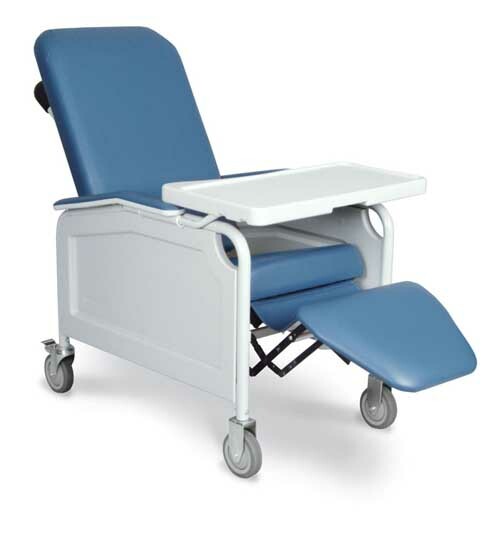 Capable of cradling patients up to 450 pounds securely and in total comfort. Choose from several wood arm options for a warm, upscale fine furnitture look. Add optional heat and massage for the ultimate in a comfortable beautiful recliner. Capacity up to 450 pounds. 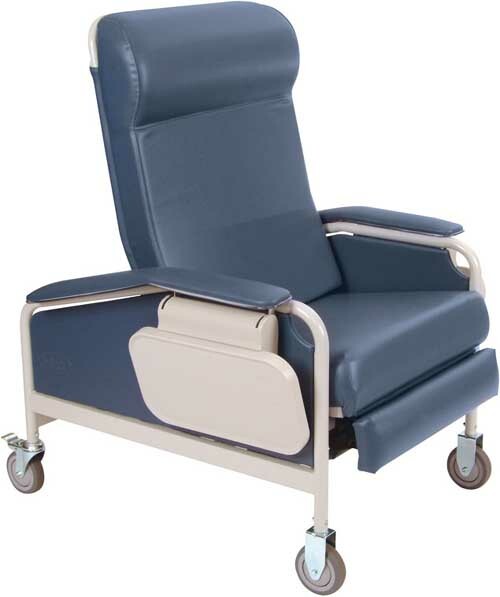 NEW 5680 represents our first Swing-Away arm recliner for Long term care, orthopedic or general hospital room useage. 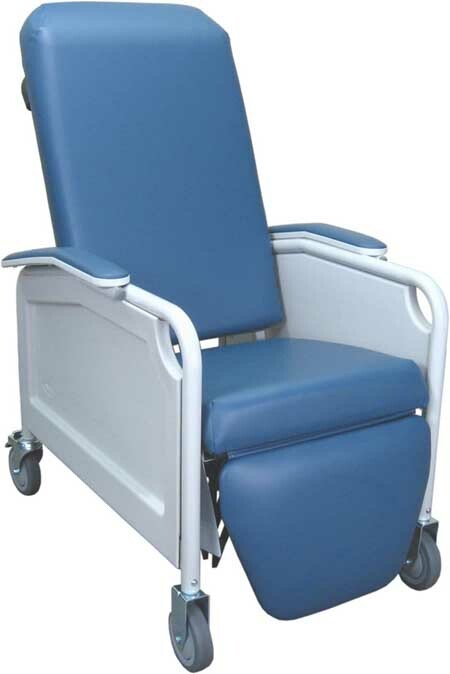 Both arms of these chairs wing wide to allow easy access for safer patient transfer from or to a wheelchair or bed and for eaiser cleaning of the chair. A simple, single rail frame, covered mechanisms and seam free arm upholstery make clean up a breeze. 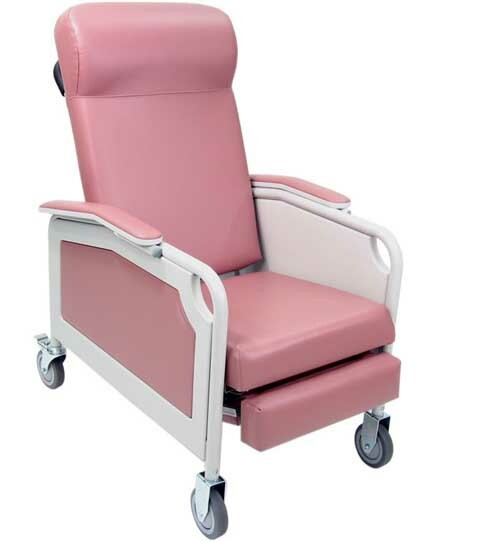 The chair features our industrial elastic suspension system to cradle your patients in comfort. The 5680 offers design options as well including two styles of wooden arm and/or available wood tables in a variety of standard and optional upgraded vinyl choices. The 5851 Lifecare Recliner features blow-molded side panels with convenient recessed grip areas and a one-section foot/legrest. It has such standard features as 5" total lock casters, non-porous blow molded tray with removable locking function and heavy gauge expanded vinyl. Winco® model 5861 is identical but removes the tray option. The 5861 Lifecare Recliner features blow-molded side panels with convenient recessed grip areas and a one-section foot/legrest. It has such standard features as 5" total lock casters, non-porous blow molded tray with removable locking function and heavy gauge expanded vinyl. Winco® model 5851 is identical but has the tray option. Winco's 5900 Elite Comfort Recliner features smooth seamless upholstery that does not collect fluids and is easily cleaned. 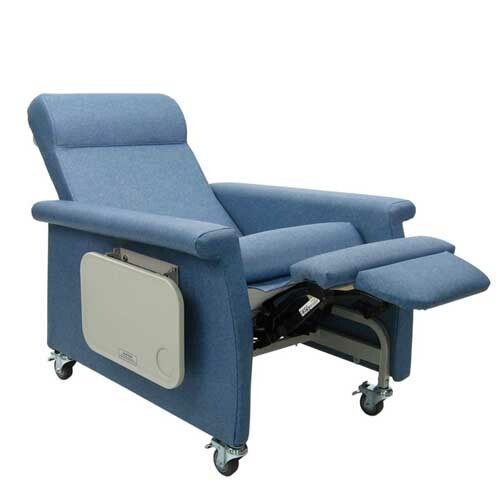 The leg rest extends automatically and three positions can be attained by the user. 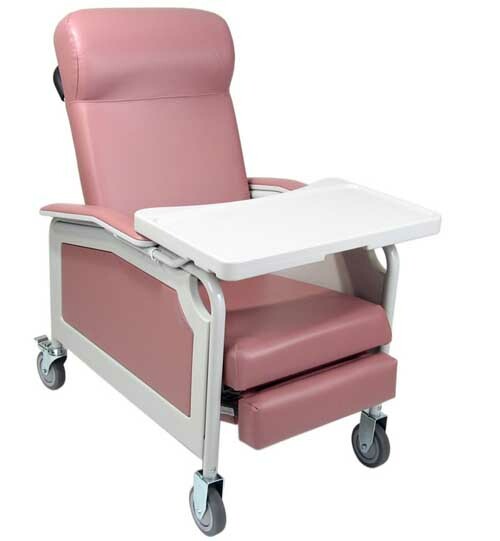 The optional non-porous blow molded fold down side tray is available on the left, right, or both sides of the chair. It also has a built-in ergonomic headrest, adjustable elastic bands on the back frame that provide exceptional comfort, an elastic open seat base, and black 3" swivel locking casters.